With over 900 challengers to have begun the challenge, the Game Character Art portion of the Ancient Civilizations Challenge was the largest and therefore one of the more competitive categories. As part of the second phase of the challenge, participants were given the choice to create their own concept or choose one of the concepts from the Character Design challenge in Phase 1 use in their submission. 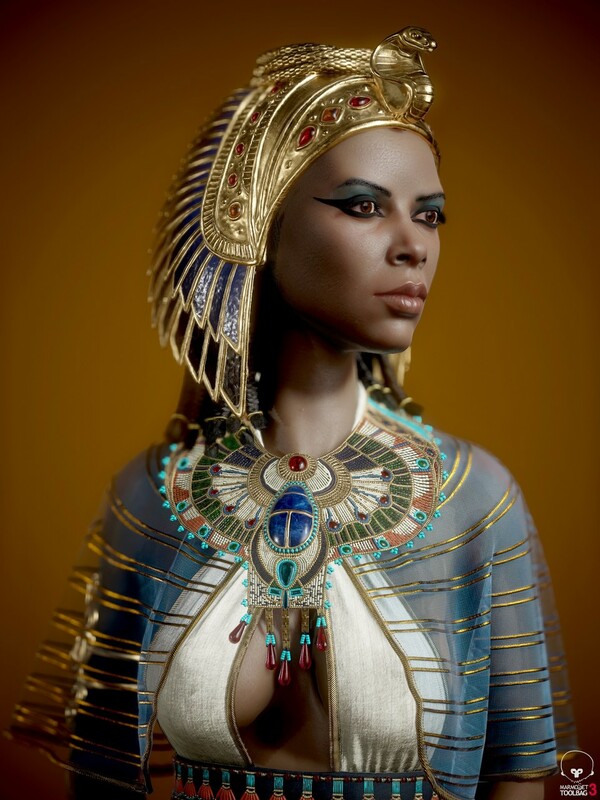 For this challenge, they needed to create one game character from an ancient civilization rendered in a real-time engine (eg. UE4, Unity, CryEngine, Lumberyard, Toolbag), with no paintovers, and a maximum polycount of 100k. 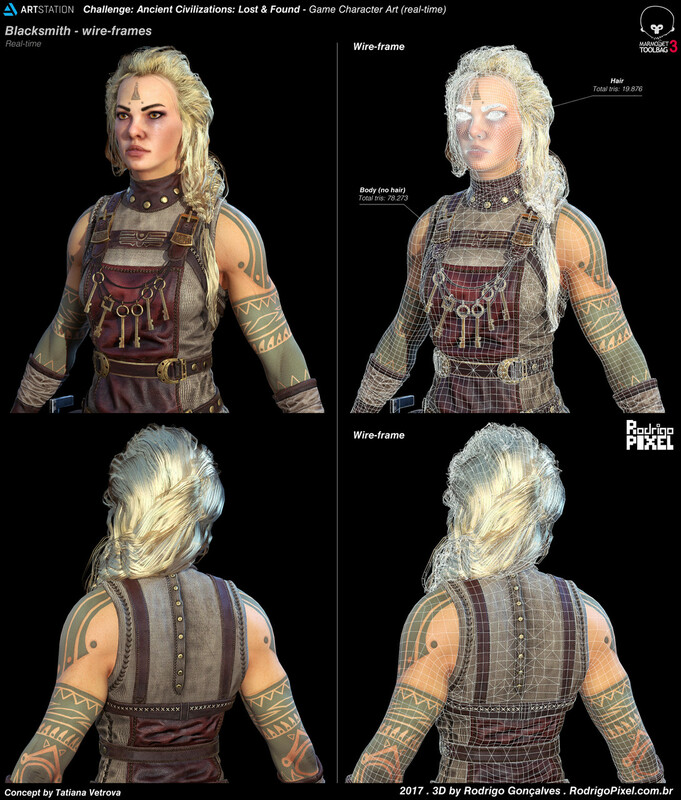 The final game character was to be presented in the Marmoset Viewer, and real-time renders of the front, back and side views of the character were also be required, along with a callout sheet of elements such as wireframes, normal mode and texture maps. The sheer quantity of incredible entries was crazy! See all submissions here. We interviewed the winners, Rodrigo Gonçalves, Georgian Avasilcutei and Valerio – Korax – Carbone so that they could tell us all about their motivation, path to success, what they gained and their advice for future challengers. Rodrigo and Valerio, you chose to pick a concept from Phase 1 of the Challenge. What drew you to the concept you chose? 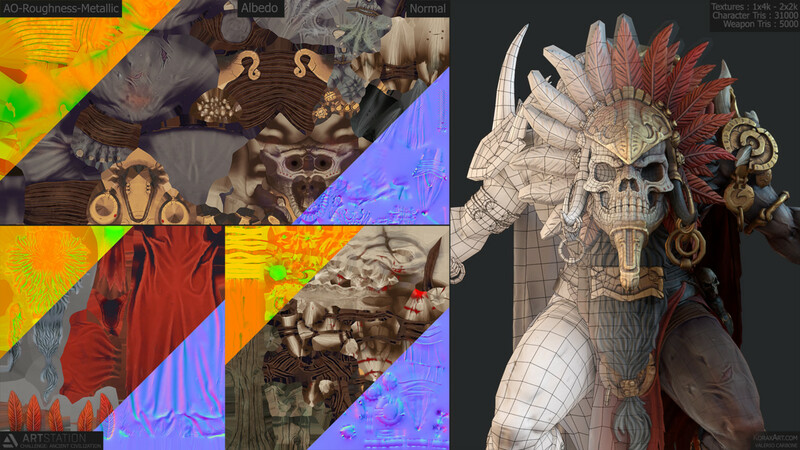 Rodrigo: I was looking to do a new 3D character for improving myself as artist and do new piece for portfolio. When Phase 1 was starting and we had the opportunity to choose one concept to do Phase 2, I was following some artists progress, and the Blacksmith concept by Tatiana Vetrova really got my attention. I saw elements I could create in 3D that would challenge myself as artist such as more realistic anatomy, skin shader and texturing, real-time hair, cloth sculpting, adding some touches detail and creating or re-design new parts that were not shown in the concept (like side purse of tools, and cloth on back view area). I was looking for something that would allow me learn something new, improve other workflows and at same time, try have some fun. Valerio: I followed the first phase very closely because the opportunity to take one of those beautiful concepts and create a 3D piece was the main reason for my participation in the contest. 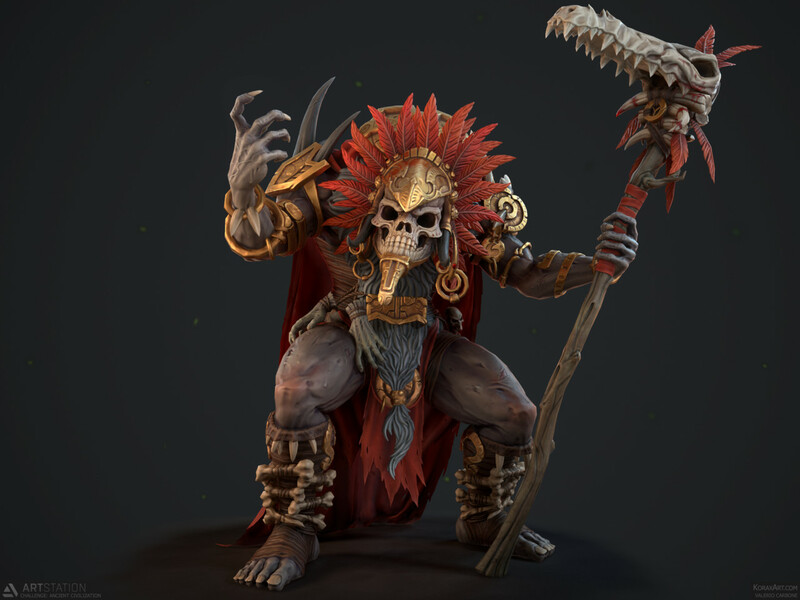 Basically, I searched for something that would fit my personal preference, I wanted to do something stylized that would challenge myself so finally I chose the one that had the most variety in terms of materials and possibility of development (bone, skin, metal, feather, fur, leather) all in one character! I knew it would be a difficult but hey… let’s do this ! What do you think it was about your piece that wowed the judges? Rodrigo: It is hard to know exactly, everyone have different thoughts for that. I think it is a combination of things done together that caught their eyes. Maybe it was the attention to further detail on some parts of texturing and modeling or the personality she had with the final pose. I focused on understanding the brief artistically and technically and tried to deliver with as much quality as possible that I could do in that time. Georgian: I think the amount of details I’ve put into my character and the clean topology and textures were the things that made the judges vote for my character. Valerio: To be honest, I don’t know! The reasons are probably half technical and half artistic. I worked hard in the re-topology phase to use every single triangle in the right direction. I used the strictly necessary polygons and UV space to get the best possible result. I followed the original mood with a little personal touch and the real strike was probably given by the presentation and the pose that made the shaman live and angry. What was your main motivation for participating in the challenge? Rodrigo: I was looking for a concept to do a new 3d character on that would have a more realistic feel for improving myself as artist technically and artistically. I was watching Phase 1 and there were a lot of awesome concepts but when I saw Tatiana Vetrova’s Blacksmith character, I felt that it would be a good chance for me to try. Georgian: I wanted to make a new character for my portfolio and a tutorial for it and the challenge started just in time for that. Of course, being part of an ArtStation Challenge is always a chance for a lot of exposure. Valerio: The motivation was very simple. It had been a long time that I hadn’t done a personal work and I was looking for an excuse to do a new portfolio pieces. Something that would represent my actual skill level and what I really love to do. When I read about how the contest worked and realized that I could confront myself with thousands of artists…No doubt, I found where I would create my new portfolio piece! Tell us a little bit about your strategy and process for creating your piece. Rodrigo: I start by studying the concept beforehand. At that stage, I try figure out and imagine how I can see that end result in 3D. Gathering some references images like real photos that can support me during production and 3D games arts that I like and feel that could be good source of inspiration. Also, before I even start producing, I try to foresee the challenges I will face during production, I try list things I need to have more attention with and thing I could fail. That helps me be more aware of my weakness and strengths at same time, so I can tackle those challenges more consciously while producing and learning as I go along, searching strategies and trying to create solutions. 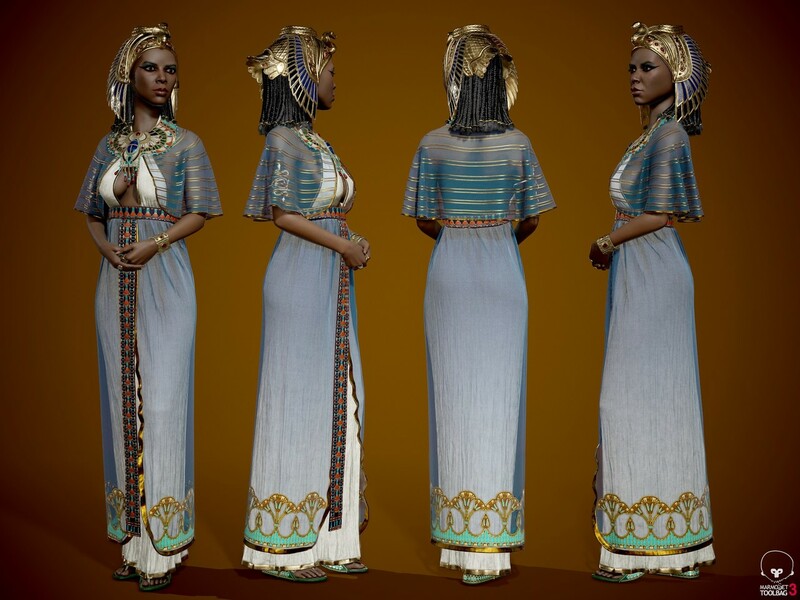 Georgian: I had chosen not to use a concept from the first part of the challenge and go for an ancient Egyptian queen since I’ve always wanted to make one. The jewelry especially seemed like a true challenge and I wanted to see if I were up to it. The process was a bit of mess since I haven’t had a concept and I had to redo some sculpting parts even after making the low poly but overall I’ve stayed in a normal character workflow and I’ve enjoyed every step of it. Valerio: There was no particular strategy. Basically the enthusiasm to be in the new place doing something I love with a great community pushed me to work late hours and nights after work to do my best. I followed the process I used all the time, I know that my strength point is the sculpt so from the first day I subdivided the time, half for the sculpt and half for the rest of the model ( a good sculpt also helps you with re-topology and textures ) and this consolidated workflow worked pretty well. Were there any other submissions you were following? What’s another submission that stood out to you in the challenge and why? Rodrigo: Yes. I was watching some submissions. One that stood out for me most on the challenge was the Marat Latypov’s submission. Impressive pose and overall expression. It feel very alive for me and it captures the action moment very well. I love stylized projects and his artwork was really cool to watch until its completion. I wish I had more time available to see more entries during the challenge since it is always good to see other artist’s creation process too. Georgian: I watched the other challengers closely during the whole challenge. There were plenty of good works out there. Tommy Gunardi Teguh‘s entry was one of them. It was a really close rendition of the really stylized character from the concept. I was actually expecting him to win. Valerio: I followed many submissions that were similar to my style. I don’t know other participants and I’m pretty new to ArtStation so when I saw something I liked, I followed the thread and tried to give some feedback if I could. What was the hardest part of your project? Rodrigo: The skin shader, real-time hair, sculpting the cloth folds and realistic anatomy were some hardest parts for me. But the funny thing is I was actually looking for a project that I could practice and improve at those things. It was a real challenge for me. 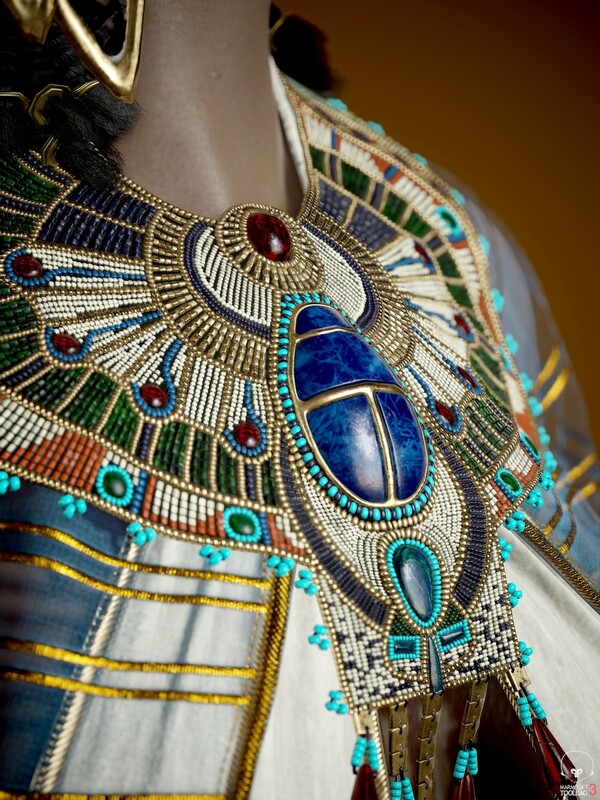 Georgian: I’ve spent a few days placing beads for the necklace’s high poly. It was exhausting. Valerio: Surely the re-topology! I sculpted a lot of complicated shapes, a lot of detail that need a manual re-topology to enhance every single shape, and when re-topo arrived I understand that probably did too much in the previous phase, so I decided to cut off some things out and focus only on what I really needed to finish the piece. Sometimes understanding where you can cut the model and optimize the work to finish in time is the most important thing. It’s better to present a finished piece than to have more detailing but not finishing it. What did you gain from participating (apart from winning)? Rodrigo: I won knowledge and got a bit stronger to face the challenges ahead. Getting critiques and feedback from the art community was great and very helpful. It helped me visualize things better so that I could improve artistically and technically from another point of view. I always try to learn something in personal project with a “deliberate practice” in mind, that helps me get a chance to review and improve the workflow consciously and to tackle my weakness while improving my strengths and trying to experiment new techniques to overcome my mistakes from the past projects. Georgian: I’ve made a lot of friends on Twitch while streaming this challenge and I’ve improved my skills a lot. Also, I’ve gained a lot of exposure and got a few job offers. I’ll say that’s quite something. Valerio: Honestly, winning was the last thing on my mind. My main goal was proving to myself I could deliver my best work in the established time – just that! So after the submission was done, from my point of view, I had already won before the results even came in. The most valuable part of the process was the people. I made contacts with a lot of artists I didn’t know and I gained and the pride in knowing that what I do is appreciated by a lot more people than I even thought possible. What’s your advice for future challengers? Rodrigo: Enjoy the creation process. Try not to just focus on the end result itself but try enjoying more of the creation process because during each step and process is where you get the chance to learn something new, try different approach, a new technique, make mistakes (and learn from them), and improve workflows. There will be frustration along the way and that is a good thing. Frustration is a sign that you care about it and want to be better on it. If the goal is bigger or more difficult than you thought, try to break this into smaller and more manageable parts to be achievable based on your current skills, time and pace. Believe more in yourself, don’t give up. It is the most rewarding feeling to know that you have finished something that you were committed to until the end and that you truly gave it your best for the moment and that you learned something new from it. Georgian: Work hard. Pay attention to details. Don’t give up. Valerio: Try! Always try to participate. You can’t know how it goes at the end unless you try! Participate for yourself, do your best and people will understand how much effort and heart you put on your art. See more Game Character Art submissions for the Ancient Civilizations Challenge here.